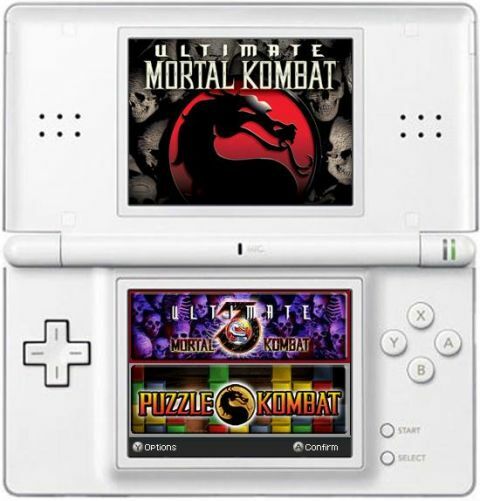 Contrary to the arcade ports of Ultimate Mortal Kombat 3 now available over Xbox Live Arcade and packaged with the PS2 version of Mortal Kombat: Armageddon, Ultimate Mortal Kombat for DS is not "arcade perfect" - it's even better, and by far the best version of the game available. Though the core gameplay is unchanged, developer Other Ocean Interactive has added several improvements to keep Midway's12 year-old classic fresh. By far the most useful addition is an onscreen moves list, which may be displayed on the top or bottom screen. No longer will victorious players have to scramble through online guides for fatalities or special moves. All buttons are fully customizable, though the moves list will not reflect changes made to the default controls, which is disappointing. As UMK veterans know, finishing the game allows players the choice of one treasure, with prizes such as Galaga or a Supreme Demonstration - every Fatality, Babality, and Friendship - among those offered. Thanks to an unlockables section, any treasure the player has selected can be viewed at any time. An ending theater has also been added. Description With a multiplayer this good, $30 isn't the only thing you'll be throwing down.